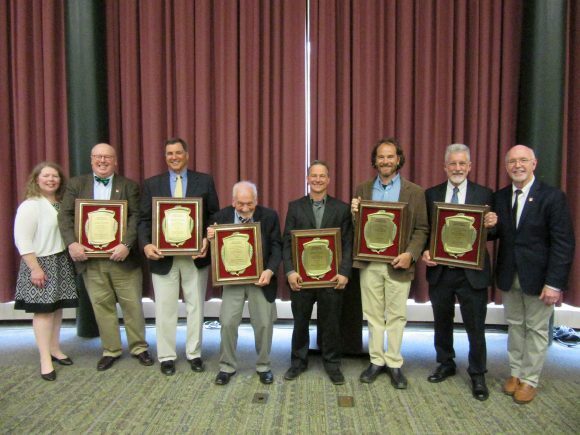 Share the post "Six Alumni Honored with George H. Cook and Dennis M. Fenton Awards"
Cook Alumni Committee co-chairs with George H. Cook and Dennis M. Fenton Award winners. (L to R) Margaret O’Donnell, program manager, Rutgers Business School Executive Education and co-chair Cook Alumni Committee; Matt Weismantel; Donald Knezick; Robert Buchanan; Andre Cantelmo; Greg Balog; Gene McAvoy; Mark Gregory Robson, professor in the Department of Plant Biology and co-chair Cook Alumni Committee. Alumni, friends, and family gathered to honor six graduates selected by the Cook Community Alumni Association (CCAA) for their career accomplishments, community service, and leadership. The ceremony was held on April 29, 2018. 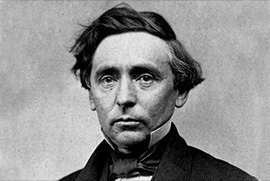 George H. Cook, as a member of the faculty in 1853. 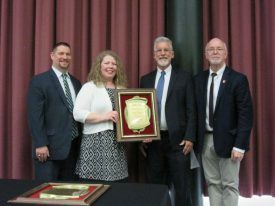 The award, established in 1976, commemorates the life of George Hammell Cook (1818–1889), whose efforts helped to bring land-grant status to Rutgers and to create the New Jersey Agricultural Experiment Station. 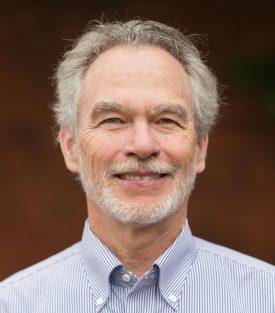 Dr. Cook’s inquisitive and results-oriented spirit remains active in the ideals embodied by the Cook community, which includes the School of Environmental and Biological Sciences (SEBS) and the George H. Cook campus. This award is presented annually to an alumnus or to alumni whose outstanding accomplishments in professional or volunteer work reflects dignity and distinction on their alma mater. The Cook Award is the highest honor presented by the Cook Community Alumni Association to undergraduate alumni. Eligible alumni are those who earned an undergraduate degree from the School of Environmental and Biological Sciences, Cook College, C.A.E.S., the Rutgers College of Agriculture or alumnae. 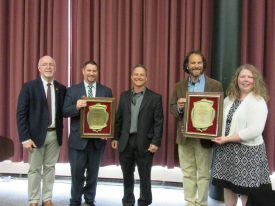 Mark Robson, Matt Weismantel, Margaret O’Donnell and David Singer, president of Cook Community Alumni Association. Matt Weismantel took the reins of the Rutgers 250 Office as senior director in November 2013. However, he initiated research to prepare for the university’s anniversary celebration several years earlier. His behind the scenes work yielded several notable achievements for the university, the school, and the experiment station. Throughout his Rutgers career, Matt has received numerous awards recognizing his individual and team achievements. He has remained active in his industry associations, frequently as a presenter at conferences to share his insights with his peers. Matt has also taken on leadership roles within his community on boards and committees related to schools, education, libraries, and civics. Mark Robson, David Singer, Andre Cantelmo, Greg Balog and Margaret O’Donnell. Andre and Greg graduated from Cook College in 1996 each with a BSc in Natural Resources. Since graduating they have had accomplishments as partners in founding and successfully building Heron Pond Farm into the third largest produce farm in New Hampshire using innovative business plans and a shared vision of sustainable farm practices. They have had an enormous impact on local food movements and their contributions to innovations in small farm economic sustainability. Mark Robson, Ileana Almageur (accepting the award for Jenice Sabb), Margaret O’Donnell and David Singer. Jenice Sabb is Assistant Dean & Director of the SEBS EOF program. She has written grants to fund programs that promote education and access for our students. Jenice has taught courses in academic skills, and she gives back to the community by volunteering to educate young women at the Delta Academy in Jersey City. 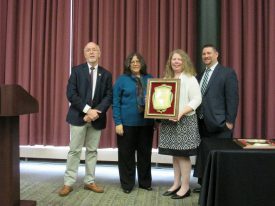 She is a past recipient of the Rutgers SEBS NJAES Staff Excellence Award. Jenice is also on the Executive Board for the EOFPANJ, coordinating conferences and serving as treasurer. Her leadership and management skills at SEBS have been a positive influence in the creation of the PASS class, an example of excellence here on campus. Jenice is highly respected and sought-after for her extensive critical thinking skills, creativity, report generating, and indisputable leadership skills. Her innovation in creating programs to enhance education has supported our students with timely graduation; programs such as the development of, and funding for, summer programs in which incoming SEBS freshman can earn credit in Biology and Chemistry. Dennis Fenton, Rutgers Ph.D. and former Vice President at Amgen, donor. Established in 2003 this award honors Dennis M. Fenton, Executive Vice-President of Amgen Inc., and a strong supporter of graduate education at the School of Environmental and Biological Sciences, formerly Cook College, and Rutgers University. Successful candidates will have a demonstrated and significant impact in their field of study. 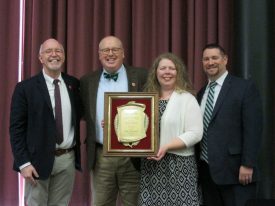 The Fenton Award is the highest honor presented by the Cook Community Alumni Association to advanced degree alumni. Eligible alumni are graduates of Rutgers Graduate School of New Brunswick, now Rutgers School of Graduate Studies, who earned a masters or doctoral degree from a program or department currently or historically associated with the School of Environmental and Biological Sciences, Cook College, the College of Agriculture and Environmental Science or the Rutgers College of Agriculture. 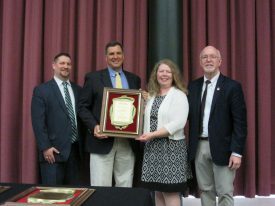 Nominees are not required to have earned an undergraduate degree from the School of Environmental and Biological Sciences or any other unit of Rutgers University. 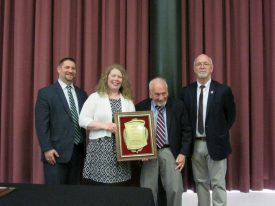 David Singer, Don Knezick, Margaret O’Donnell and Mark Robson. Don Knezick, founder and president of Pinelands Nursery, the largest supplier of native plants for environmental improvement in the east and one of the biggest in the US. He has built this business into a leader in the environmental improvement/restoration practice industry. Don also plays a nice role for Rutgers, donating plants to grad and undergrad students that are doing experiments to improve restoration practice. He has both BS and MS degrees from Rutgers. David Singer, Margaret O’Donnell, Gene McAvoy and Mark Robson. Gene is a faculty member at the University of Florida and county extension director. He is the Vice President of the National Association of County Agents. He has won the Syngenta Resistance Fighter Leadership Award 2015, the Excellence in Crop Advising Award 2009, Florida Farm Bureau Distinguished Service Award, National Association of County Agricultural Agents Achievement Award, National Association of County Agricultural Agents, Dallas Townsend Extension Professional Enhancement Award, University of Florida, Seymour Goldweber Extension Professional Enhancement Award, University of Florida and the Farm Credit Young Professional Award. David Singer, Margaret O’Donnell, Robert Buchanan and Mark Robson. Dr. Buchanan has authored or co-authored over 200 research manuscripts or review articles, and an equal number of published abstracts on a wide range of subjects related to food safety microbiology and toxicology. He has presented several hundred invited lectures and presentations on a wide variety of scientific and regulatory topics to groups on six continents. He is a fellow of the American Academy for Microbiology and the Institute of Food Technologists. He was member of International Commission on Microbiological Specification for Foods for more than 20 years and was the Head of Delegation for the United States to the Codex Alimentarius Commission Committee on Food Hygiene for 10 years.